Do you enjoy Mexican food? How many cans of it have you bought in the last year? Have you noticed that the prices are steadily rising on it? Wouldn’t you like to save some money? Enchilada sauce is not hard to make. In fact, if you have mastered that Gulf Coast/Southern/Cajun task of making roux…you’ve got the basic skill already mastered. Seriously. It’s really that easy. Enchilada sauce isn’t that magical and mysterious stuff that certain companies would like to believe it is. It’s also not something that requires hours and hours of work. It takes about five minutes to make usually. It’s so easy that I don’t ever measure anything to make it! It does have ONE secret ingredient that will make or break your endeavor though, and it happens to be one that isn’t always easy to find here on the Gulf Coast. Chili powder, or specifically ground chili peppers. Because it forms the foundation and entire first floor of flavor, chili powder is critical here. You don’t want the cheap stuff that has more salt and strange additives than chili powder. I’ll make a confession here. I have mine sent to me from family in the Southwest. I’m not only not native to the Gulf Coast, but I also come from a family of chili snobs. We’re as nuts about chili as any wine connoisseur is about wine. We don’t sit around and discuss chilis in esoteric terms that make no sense, but we still continually debate the merits of different chilis, blends, and even locations where chilis are grown. I’ve roasted and peeled more sacks of chilis than I want to think about. I also know where I order chili powder from when I can’t get it from “home”. Pendery’s. I don’t place a lot of orders, but when I do, I relish their arrival. It’s one mail order company that I don’t mind recommending as a great source for chilis of all kinds, as well as other spices that you may desire, but not find locally. It’s also got great prices for those of us who use more than the average bear, you might say. In chili discussions, you will hear a lot of discussion of front burn, back burn, mid burn, fruity, smoky, etc. It’s confusing to me, and I’ve lived with chilis my entire life, so don’t worry if you don’t “get” the differences. The important thing to pay attention to is the amount of heat (expressed in Scoville units, Heat Units, etc.) and the higher the numbers…the hotter the chili is. Color is another good indicator. Dark colors tend to have deeper, richer flavors, but can have an element of bitterness that their roasting brings out, so don’t focus just on dark colored ground chilis. Lighter, brighter colors can have a “grassy” or more “green” flavor, but also tend to be lighter and brighter tasting, offering a good balance against a darker colored variety. Chili powder also does not store forever. It needs to be stored in a cool, dry place, as well as out of direct sunlight, which hastens the break down of the volatile oils that provide the flavor in the chili powder. It also doesn’t keep as long once it has been ground. (The same is true of all herbs and spices, by the way.) Use chili powder within 12 months. Keep it tightly sealed and away from strong scented products. Never, ever, store laundry products and soaps in the same area as your food products, especially herbs and spices. Also do not store them over your stove–that’s the hottest and most humid place in your kitchen! I don’t use salt either, instead opting to use beef base (the paste version of bouillon) as my salt as well as to make the sauce taste richer. I use oregano, and while Mexican oregano is preferred (try Winn Dixie for Mexican oregano–most stores have some with their other Mexican food products) any type will do. I simply crush the leaves between thumb and forefinger in the palm of my other hand before adding to the roux. I also use ground cumin (comin0) in enchilada sauce–whole cumin would leave the seeds visible in the sauce, which I did not want. I use roughly equal amounts of oil, whole wheat flour and chili powder to start the roux with, adding the oregano, cumin, beef base, and a bit of minced garlic with only about 30 seconds to cook before the roux is pronounced “ready” and the water is added. This is because these particular parts can rapidly overcook and become bitter, but a small amount of cooking enhances their flavors. Thirty seconds is about long enough to do the job without over doing the cooking. I then add the hot water, whisking continually to ensure a smooth sauce. The entire mixture is stirred continuously as it is brought to a boil, cooked for about a minute, and then removed from the heat. Add oregano, cumin, beef base and garlic and stir continuously for about 30 seconds. Stir in about 3 c. of water, whisking mixture continuously to prevent lumps. Continue stirring and cooking over medium high heat until mixture begins to boil. Add more water until desired consistency is achieved. Reduce heat and simmer for about 3 minutes. Remove from heat and use as desired. So, once you have made it, what are you going to do with it? Obviously, it can be used to make enchiladas. You can add meat or cheese, and use it as a hot dip too. It’s also used to make my favorite: burritos, enchilada style. 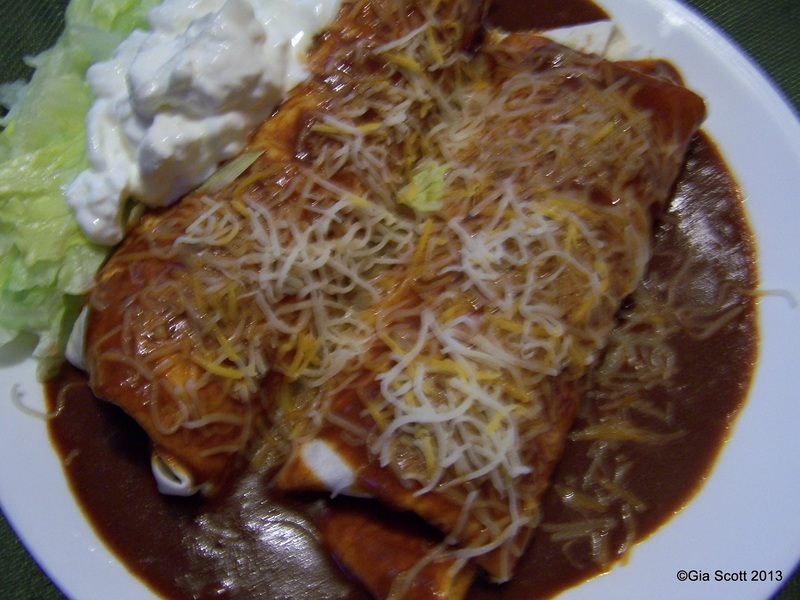 I happen to love green chili burritos with the red enchilada sauce. In the photo above, however, I had an inexpensive hamburger filling that also contained rice but that’s a recipe for later. Stay tuned for more recipes and ideas! This entry was posted in Budget, Easy, Ideas, Quick, Recipes and tagged budget, chili, copycat, easy, enchilada sauce, kitchen secrets, mexican, recipes. Bookmark the permalink.